This weekend was chock full of activity! Saturday late afternoon through the night was spent rigging the Boys and Girls Club for the Alloy show. Many many many trips up and down 30' ladders have my legs feeling pretty achey today. We had to hang 8 12' wide by 19' tall velvet curtains from the ceiling of the gym, which of course was never built for such a thing. So we set up a pair of extension ladders and two of us would haul the curtain, mounted on a 10' steel pole, up to the rafters and tie it up there, then down and move one ladder, and back up to add a third rope to the middle of the pole. Repeat seven more times. Then we had all the stage lights to mount to the rafters, and the power cords to the lights. We finally got to our tech run at about 9:15 PM. Once that was set, we had a full show run through starting at 11:00 PM. I think I got home around 12:45 AM. Sunday morning, after a solid 7 hours of sleep, I started the day with a long, hot sauna, followed by cool water and a latte. I could already feel muscles complaining about all the bending, lifting, reaching, and oh yeah, dancing the day before. Our call for the show was at 1:30 PM, so we finished the rigging work and taping down of all cables and so on. Then as the House doors were opening at 3:00 PM, we all had costume and makeup to do. The 4:00 PM show was sold out, and went pretty well. Any difficults or mess ups were minor and not apparent to the appreciative sold out crowd. We had an hour of break, then did another show at 7:00 PM. The piece I was in ran better at the 4:00 show, and we had some eye-popping spin going on at the later show that made things, um, interesting and uncomfortable. Hopefully that was mostly hidden from the crowd. After the show we had to strike everything: curtain, lights, power, and apparatus. I was thrilled to get home by 10:30 PM. With all that going on, I totally missed Pagee Go Go's first ever CD release performance on Saturday night. Dang! No husband points were scored by me that night. It was great to see a bunch of PGG band in the audience at our shows on Sunday. I hardly had any time this weekend to poke around in my yard to see what new might be sprouting. In addition to the crocus and Siberian iris in bloom, I have daffodills that will likely bloom this week, and daylilies, tiger lilies, hosta, sedum, and bleeding heart up. I'm wondering if my Dutchman's Britches survived? I noted that the stalks from the dahlias that didn't get lifted last fall still feel sturdy, so it's possible that the rhizomes survived. We'll see in a couple of weeks. 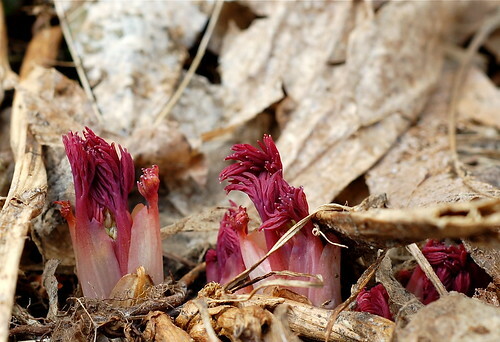 I leave you with a picture of the anemone-like bleeding heart shoots.